By hungry runner on January 15th, 2013 . Filed under: Blogs, Cupcake Ideas, Recipes . 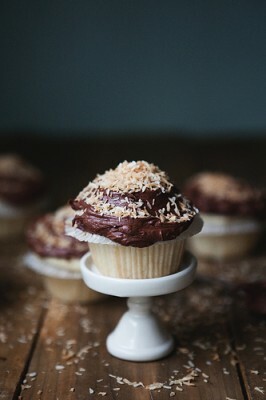 For a few years now I have been reading The Little Red House’s blog but I somehow didn’t realize these Almond Cupcakes with Chocolate Coconut Buttercream were from her blog when I repinned the cupcakes on Pinterest. I have been trying to eat more almonds since the fall when I learned some of the latest research about almonds which help keep you full longer and keep blood sugars steady hours after consuming them. Almond cupcakes would count as eating almonds, right? Even if they don’t count, I still think these cupcakes sound and look great based on The Little Red House’s picture shown above.